Just this last week Microsoft released the cumulative update KB4476976 that fixes a lot of issues like the File Explorer crashing or stopped working when the Timeline feature is turned on, unresponsive audio playback, local experience, and language pack issues, etc. Additionally, the update also includes many quality improvements. Microsoft recommends installing the update as soon as possible to fix the said issues. To install KB4476976 update, open the Settings app and to "Update and Security -> Windows Update" and click on the "Check for updates" button. Windows will check for the available update and will download KB4476976 update and installs it automatically. If not Windows did not download the update for some reason, you can download KB4476976 update offline installer using the download links below. 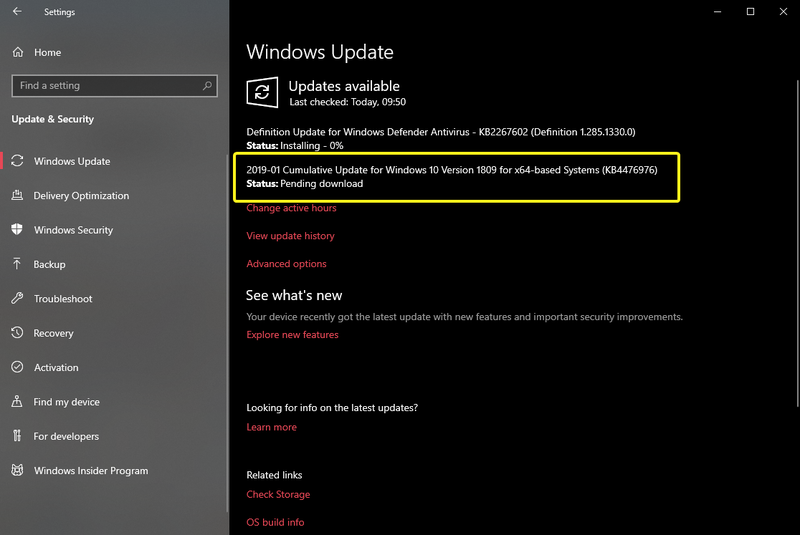 Here's the direct download link for KB4476976 update. You will find installers for both 64-bit and 32-bit operating system in that download page. Depending on your system architecture, download the one you need. You can install KB4476976 like any other software. Don't forget to restart Windows to apply the update. Like I said before, the Windows 10 version number will be updated to 17763.292. Addressed an issue that causes virtual machine (VM) creation to fail when Node Interleaving is enabled.